Sadly, it was reported the other day that researchers at the U.S Geological Survey in Alaska tracked a female polar bear that swam nine days in search of an ice floe. The bear lost 22% of her own body weight and her young female cub who did not make the destination. Polar bears spend much of their time on shifting Arctic ice floes and mostly feed on ringed seals, who are also dependent on these ice floes, and are commonly found in the shallow coastal waters off of the continental shelves. 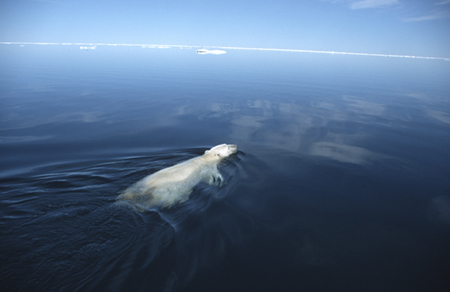 However, the dramatic melting of the ice in recent years has forced polar bears to swim longer distances in search of sea ice or to forage off shore to look for food. Unfortunately, this recent case in which a polar bear swam nine days, has acted as an example of what is now a sad reality. This news story was originally reported in the LA Times.